CHARLESTON, S.C. – Golf icon Jack Nicklaus and Delaware North, a global hospitality and food service company, today formally celebrated the grand opening of the Jack Nicklaus Golden Bear Grill at Charleston International Airport (CHS) in South Carolina, a 1,234-square-foot restaurant space that seats up to 80 guests in the airport’s main terminal. 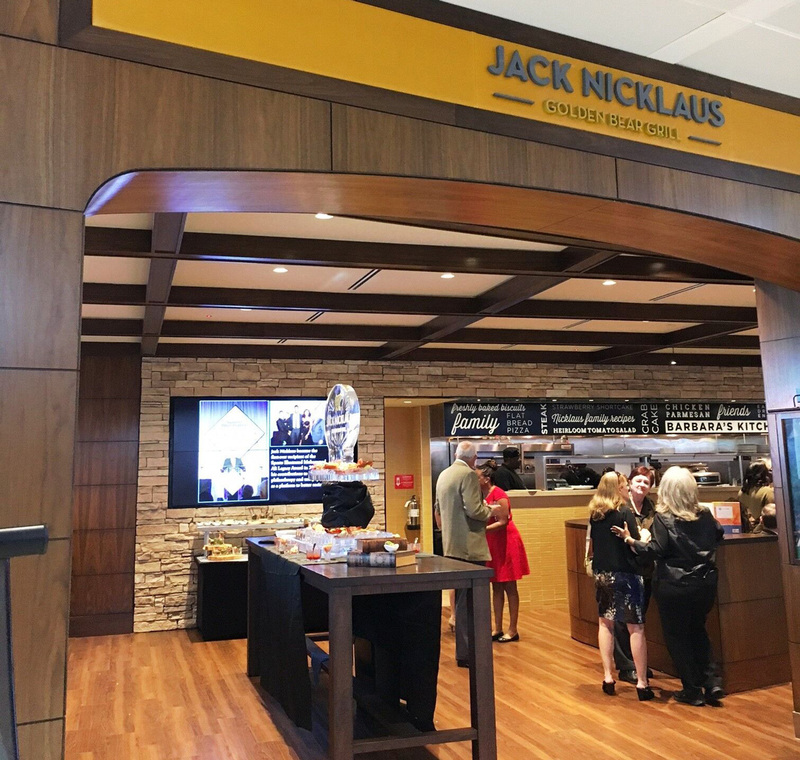 The restaurant began operations in September as part of the airport’s ongoing Terminal Redevelopment and Improvement Program, becoming the second Jack Nicklaus-branded restaurant to open this year. The restaurant concept was introduced in July 2016 at Fort Lauderdale-Hollywood International Airport in Florida. Today’s grand opening was marked by a ribbon-cutting ceremony, a VIP event, and a Q&A with area media. Special guests were Jack Nicklaus and his wife, Barbara; Executive Director and CEO of Charleston International Airport, State Senator Paul Campbell Jr.; former Charleston Mayor Joe Riley; officials from CHS and the Airport Employment and Training Center; and members of the Nicklaus family. In addition, country music star Darius Rucker stopped by to congratulate Jack and Barbara. The Golden Bear Grill is beautifully decorated with memorabilia and at least 15 Nicklaus family photos hand-selected by Jack and Barbara to connect customers to the storied legacy of golf’s greatest champion, ambassador, course designer and philanthropist. The restaurant not only celebrates the game of golf, it also celebrates the life and lifestyle that surrounds the game. Jack’s wife Barbara worked closely with Delaware North’s concept and design team to create the warm, inviting and comfortable interiors. Many Nicklaus-branded products are for sale at the restaurant including Jack’s House and Jack Nicklaus Private Reserve by Terlato Wines; three flavors of Jack Nicklaus Ice Cream by Schwan; and Jack Nicklaus AquaHydrate Water. The Well Done! cookbook is also available for restaurant patrons who want to cook like the First Lady of Golf and eat like the Golden Bear—or who are simply looking for a quick gift before reaching their destinations. The restaurant also features an optional round-up for charity program benefitting the Nicklaus Children’s Health Care Foundation. Delaware North is one of the largest privately-held hospitality and food service companies in the world. Founded in 1915, Delaware North has global operations at high-profile places such as sports and entertainment venues, national and state parks, destination resorts and restaurants, airports, and regional casinos. Delaware North has annual revenue of $3 billion in the sports, travel hospitality, restaurants and catering, parks, resorts, gaming, and specialty retail industries. Learn more about Delaware North, a global leader in hospitality and food service, at www.delawarenorth.com.